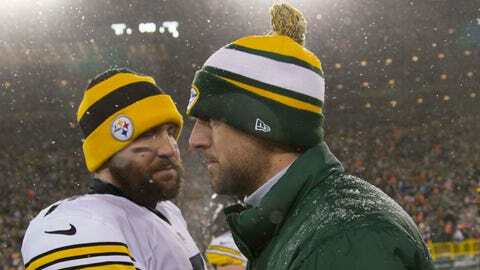 Aaron Rodgers talks to Steelers quarterback Ben Roethlisberger on the field after Pittsburgh beat Green Bay 38-31 on Sunday. GREEN BAY, Wis. — For the past several weeks, the Green Bay Packers have waited until the Friday before each game to rule out quarterback Aaron Rodgers. That is not how the team plans to go about it this week heading into their regular-season finale against the Chicago Bears that will decide the NFC North champion. "Hopefully we can get the question answered sooner than later," coach Mike McCarthy said Monday. "We’re still working on that." Rodgers has missed the past seven games after fracturing his left collarbone — coincidentally, an injury that happened at the hands of the Bears in the two teams’ first meeting of the season. However, Rodgers has been practicing on a limited basis since Nov. 26. McCarthy said there is "a lot of conversation going on" between himself, Rodgers, general manager Ted Thompson and team physician Dr. Pat McKenzie. The Packers will not be holding their normal Wednesday practice, as McCarthy will give the team off for Christmas Day. Therefore, it will likely be Thursday when Green Bay announces its decision with Rodgers. "This is something I think clearly after seeing Aaron practice for two weeks, this is something Ted Thompson and I need to sit down and we need to assess all the information and to decide if it’s time for him to play," McCarthy said. "Aaron wants to play, has wanted to play for the last couple of weeks. He fully accepts, understands everything going on with his injury, so this is really a decision for Ted Thompson and I representing the organization. That’s how it works." McCarthy was asked Monday if Rodgers had yet to be medically cleared, and for the first time, he didn’t directly answer the question. "We’re still gathering information today," McCarthy said. "There’s testing and things to get done, so we’re still working through that." The recent medical scans had not shown enough healing in Rodgers’ left collarbone, so the Packers weren’t allowing him to play in a game due to the risk of further injury. On the Friday before Green Bay hosted (and eventually lost to) the Pittsburgh Steelers, McCarthy repeatedly said it was an "organizational decision" to rule Rodgers out. That still might be the outcome, forcing backup quarterback Matt Flynn into his fifth consecutive start, but the Packers aren’t going to delay the process again this week if they aren’t ready to medically clear Rodgers. "Sooner than later," McCarthy said. "I think No. 1 for the football team and also for Aaron Rodgers, I think it’s important for us to make a quicker decision. This has obviously been frustrating and stressful for Aaron, rightfully so. But also our football, I want them to know who the quarterback’s going to be." There was a report over the weekend that there was growing friction between Rodgers and McCarthy over how the team has handled the situation publicly in recent weeks. McCarthy denied it, though. "I’m very confident with my relationship with Aaron Rodgers," McCarthy said. "I mean, he’s frustrated that he’s not playing. I have no problem with our relationship." If Rodgers does make his return Sunday in Chicago, it will be one day shy of eight weeks since an injury that was originally expected to keep him out between 6-to-8 weeks.